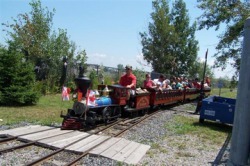 The dream of two men, Stan Lawlor and Rod Johnston, to create a "Miniature" Railway and preserve the heritage of rail in North Bay, became a reality July 29th, 1994 with the official opening of the Heritage Railway Company. A steam and diesel engine and two coaches were purhchased in October of 1993 in Cleveland, Ohio. They arrived in North Bay in February of 1994. The engines and coaches were totally refurbished, sandblasted and painted. During this period a large contingent of retired railway workers from the CNR, CPR and ONR were enlisted (some 50 in total) to do this work and build a rail line. The actual line, a half-mile, was completed in one week. In 1996 we erected a station - a van (caboose), a gift from the CPR. Rolling Stock includes 2 steam engines, 2 diesels, 8 passenger cars and caboose and a car barn was built in 1998. Ask the volunteer workers to explain the history and legend of rail in North Bay. They have, in total, in excess of 900 years of rail experience. We believe "Our Heritage" is important. The "Charter" volunteers are acknowledged, by the "Mileage Posts" along the line. The spring of 2006 saw the addition of a brand new locomotive to our fleet as the little "Lucy Dalton" replica steam engine look-alike took to the tracks. This is a nod to North Bay's railroading history as the original Lucy made her first appearance in North Bay in 1882. As the very first locomotive to come to North Bay, she has a special place in our history. This season, the beautiful one of a kind C.P.R. steam locomotive has been honoured with a homecoming at the Heritage Railway. The "little Lucy Dalton" has joined our fleet. You can watch her making her way along the waterfront just like she would have almost 125 years ago!